I wouldn’t normally blog about my Saturday long run, but DailyMile was down and I had thoughts I wanted to put down. I had 12 on the schedule for Saturday. I really didn’t want to run by myself. I know I can, I am just sick of it. Thankfully Tracey saved the day and emailed me asking if I wanted to join for a run this weekend. Yay! I knew that Tracey and Rochelle probably had a million miles to run this weekend, but I love that they will do loops to include other people. I met up with Tracey, Rochelle, Annie and Ali at 6:30. I took the long route to Tracey’s house to get in a bit more mileage before we started. The first loop was the airport run where you end up on the south end of the airport and we were able to see a few planes take off. We looped back to Tracey’s house where Annie and Ali were done for the day. Tracey, Rochelle and I set out for more miles, a lot more for Tracey and a few more for me and Rochelle. I separated from Rochelle with less than a half mile to go and ended with 12.12 in 2 hours. This was a great run. I am really happy with the pace I kept. I went out slow and was able to push it during the second half. I had really good miles 8-12. I had a great time chatting with Tracey during the first half and then talking with Rochelle on the way back. Running buddies are fun. It makes the time go by quicker plus I learned some new routes near my place. Getting up at the crack of dawn sucked, but was so worth it when I was done with my run before 9:00am. Plus it means I get to nap. I hope everyone else had good long runs this weekend. 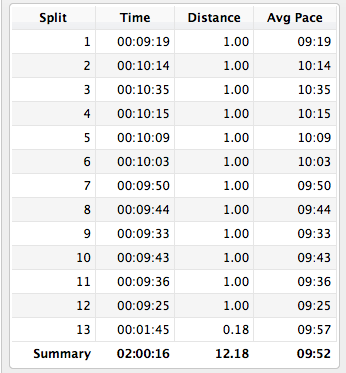 I was too lazy to type my splits, so here they are. Plans for the rest of the weekend: NOTHING (other than sleeping and laundry). I am so excited for a low key weekend. How did I forget how awesome the post-long run nap is? It was phenomenal. So was doing nothing the rest of the weekend. Although doing nothing kept me quite busy actually. I did 4 loads of laundry, cleaned my apartment and started watching Mad Men. I know I am years late to the party, but um, yeah, it is good. I also realized that August will be my highest mileage month in a year! Take that stress fracture and lack of motivation!